Our friends at Gun Owners of America and the Virginia Citizens Defense League have reminded us that the concealed carry reciprocity bill introduced by Republican Rep. Richard Hudson (NC-8) is being marked up by the House Judiciary Committee today. Under Hudson’s legislation, H.R. 38, The Concealed Carry Reciprocity Act of 2017, every state will recognize the constitutional right to concealed carry for the protection of you, your family and your friends. But this is just the beginning say our friends at GOA. Under the Hudson bill, every state would also recognize the concealed carry rights of residents who come from Constitutional Carry states. * Allow guns on virtually all federal lands, to the same extent as our 2011 amendment authorized guns in parks, subject only to the laws of the state where the lands are located. The Chairman of the House Committee on the Judiciary is Rep. Bob Goodlatte (VA-6). Our friends at the Virginia Citizens Defense League advise us that Chairman Goodlatte will have some amendments to H.R. 38 that will improve it and that they expect to support. The main changes in Goodlatte's bill are to add National Forests as a place where a CHP holder can carry. The substitute also adds off-duty and retired police officers as authorized to carry concealed in school zones. H.R. 38 has 213 co-sponsors, all but three of whom are Republicans, but this doesn’t mean that it is a lock to pass the House. According to Dave Workman of Liberty Park Press, there are an estimated 16.5 million Americans who are licensed to carry concealed sidearms in the United States. Many states have individual reciprocity agreements with other states, but there is no national recognition, which may seem counterintuitive since gun control advocates have, for years, argued that guns should be licensed and registered just like cars. They have not, however, included in that argument that concealed carry licenses or permits be honored across state lines. Workman says that when H.R. 38 clears committee it is expected to face stiff opposition from Democrats representing states with very restrictive gun laws including New York, New Jersey, California, Maryland and Connecticut. Which is why it is crucial for those who value their Second Amendment guaranteed rights to get on the telephone to call their Representative to urge him or her to support H.R. 38. The Capitol Switchboard is 1-866-220-0044 we urge all CHQ readers to call their Representative TODAY in support of H.R. 38. Submitted by email_registrat... on Thu, 11/30/2017 - 09:19. The bill is a dastardly trick and a Trojan horse for institutionalizing licenses, permits, national ID cards, etc. And the end game of all those licenses, permits, national ID cards and such is eventual confiscation of all arms. And after that extermination. gun control and the 2nd Amendment. Submitted by jon exner on Wed, 11/29/2017 - 12:17. I believe there was a recent decision by a federal court that supported the notion that automatic or semi automatic weapons could be restricted from the American citizens based on them being weapons of war. Well when the Constitution was written and the 2nd Amended was inserted just what kind of weapons of war does that judge think was available, the same kind of weapons that the government had. And that is the whole point of the 2nd Amendment allowing the American citizens to own guns for their protection against government abuse. It was not about hunting, it was not about target shooting and only somewhat about protecting ones own home. Now as to this bill about reciprocity, is it really necessary or would Article IV, Section 2 cover what this bill would intend to create, the right of American citizens in one state to own and carry weapons across State lines? ARTICLE IV, Section 2 reads as follows. The citizens of each state shall be entitled to all privileges and immunities of citizens in the several states. 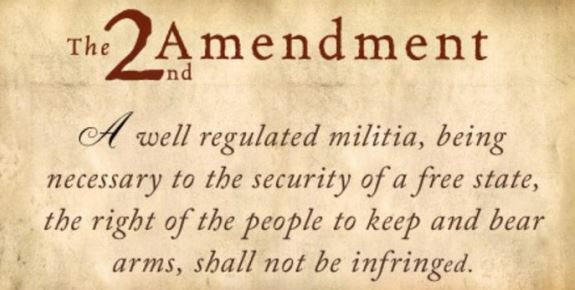 Since the 2nd Amendment is a Federal issue just how did the courts ever believe that the states could regulate guns to begin with is unbelievable.